AUCTION DATE: THURSDAY OCT 22, 2015 @ 10:30 A.M.
(2) Bridgeport 6” Machine Vises. Etalon 12” Dial Height Gage. Fowler 12” Vernier Height Gage. 24” x 36” x 4” Granite Surface Plate w/Stand. Herman 20” x 30” x 5” 2-Ledge Granite Surface Plate w/ Rolling Stand. Yale mdl. GLC050DENUAE083 5000 Lb Cap LPG Forklift s/n N548101 w/3-Stage Mast, 190” Lift Height, Side Shift, 4th Accessory Actuation Lever, Cushion Tires. (2) Big Joe mdl. 9957 Electric/Hydraulic Die Lifts. Lexco mdl. DH-3438-24 Die Separation Cart s/n 27073. Pallet Racking and Steel Shelving. Mettler mdl. SB32001 Digital Counting Scale. Trump mdl. K2V Vertical Mill s/n K2V-681 w/ Newall Sapphire DRO, 70-4200 Dial Change RPM, Chrome Ways, Power Feed, 9” x 49” Table. Takisawa mdl. 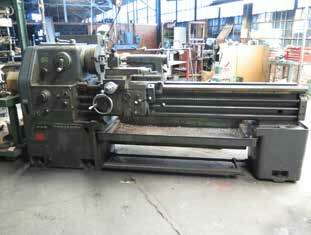 TAL-510 20” x 64” Gap Bed Lathe s/n 24X82523 w/ 25-1500 RPM, Inch/mm Threading, Tailstock, Aloris Tool Post, 12” 3-Jaw Chuck. Thompson 12” x 24” Automatic Surface Grinder s/n 21686 w/ Electromagnetic Chuck, Wheel Dresser, Coolant. DoAll mdl. V16 16” Vertical Band Saw s/n 1650756 w/ Blade Welder, 50-375 FPM.Wells mdl. 8-M-43 8” Horizontal Band Saw s/n 4893. Everett mdl. 14-16 16” Abrasive Cutoff Saw s/n 6734 w/ Chain Vise. Ruvo 7” Abrasive Cutoff Saw. DoAll mdl. BF Band Filer s/n 8-51722. Detroit Power Screwdriver Co. mdl. U Automatic Screw Insertion Machine s/n 17227 w/ Bowl Feeder. Yuasa “Accu-Tap II” mdl. ATS-004 Automatic Tapping Machine s/n 117984 w/ 1000-2000RPM. Kingston mdl. KUD-540 Power Drill Press w/ 75-1525 RPM, 12-Speeds, Power Feeds. Buffalo Deep Hole Drill Press w/ 4-Speeds, 17” x 22” Table, Procunier Tapping Head. Accu-Finish Series II Carbide Tool Lapper. 12” Disc Sander w/ Dust Collector. Globe Mixer Style Media Tumbler. Linde VI-252 Arc Welding Power Source w/ Linde MIG Welder Wire Feeder. Lincoln Linkweld Aircraft DC225MK Arc Welding Power Source. 48” x 48” Welding Table. Quick-Work / Whiting mdl. 43HV Flash Trimming Machine s/n STK38X89. Coil-Matic mdl. XHF1218 12” x 18” Straightener / Feeder s/n 782140296. Press Room Equipment mdl. A-2 18” x 22” Straightener/Feeder s/n W087-121. Press Room Equipment 12” x 6” Straightener / Feeder. American Steel Line mdl. 60 18” x 2500 Lb Cap Coiler s/n 2717. Littell No. 3 300 Lb Cap Double Centering Reel. Verson 300-HD-1-60 300 Ton Long Stroke Hydraulic Press s/n 4961 w/ 38” Stroke, 29” Shut Height, 48” x 62” Bolster Area, Safe-Scan Light Curtain. Vernon No.8 OBI Stamping Press w/ 4 ½” Stroke, 10 5/8” Shut Height, 24” x 35” Bolster Area, Payton Rogers mdl. D16 Knockout Cushion with 2 ½” Stroke. Minster No. 7 OBI Stamping Press w/ Pneumatic Clutch, 22 ½” x 36” Bolster Area. Bliss No. 28 95 Ton OBI Stamping Press s/n H39704-HP23827 w/ 28” x 38” Bolster Area. Minster No. 6 OBI Stamping Press. Walsh No. 65 65 Ton OBI Stamping Press s/n 10343 w/ 18” x 32” Bolster Area. Walsh No. 65 65 Ton OBI Stamping Press w/ 18” x 32” Bolster Area. 40 Ton Hydraulic Long Stroke Press w/ Knock-Out Cushion. Bliss No. 41 mdl. SJP211 Stamping Press s/n SJ10059 w/ 3” Stroke, 2 ½” Slide Adj., 18 ½” Shut Height, 23” x 28” Bolster Area, Adjustable Bolster Height. Perkins mdl. 450B 35 Ton OBI Stamping Press s/n 35730 w/ Pneumatic Clutch, 3” Stroke, 2 ½” Ram Adj., 11” Shut Height, 14” x 26” Bolster Area. Perkins mdl. 375-B 28 Ton OBI Stamping Press s/n 41961 w/ 3” Stroke, 2 ½” Ram Adj., 9 ¼” Shut Height, 12” x22” Bolster Area.L & J No.3 ½ 27 Ton OBI Stamping Press w/ 2 ½” Stroke, 2” Ram Adj., 8 ¼” Shut Height, 14 ½” x 22” Bolster Area.Johnson Machine No. 4 OBI Stamping Press w/ 15” x 28” Bolster Area.